Since I am a foodie who also writes a food blog, restaurants are destinations for me - whether I'm on the road or close to home. I love when I can find a restaurant that is more than a place that serves food. Beggar's Pizza in Lansing would be one of those. Known for their hearty pizza with toppings piled high, the Beggar's Pizza chain has close to two dozen locations in and around Chicago and into Northwest Indiana. The Lansing location is my favorite. Decades ago it was a movie theatre before becoming Pipes and Pizza, a pizzeria that features a pipe organ. 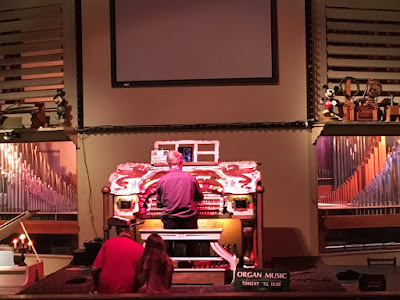 When Beggar's took over the building, the owners continued the tradition of live organ music and you can still visit on a Tuesday or Friday night to hear the big pipe organ played.